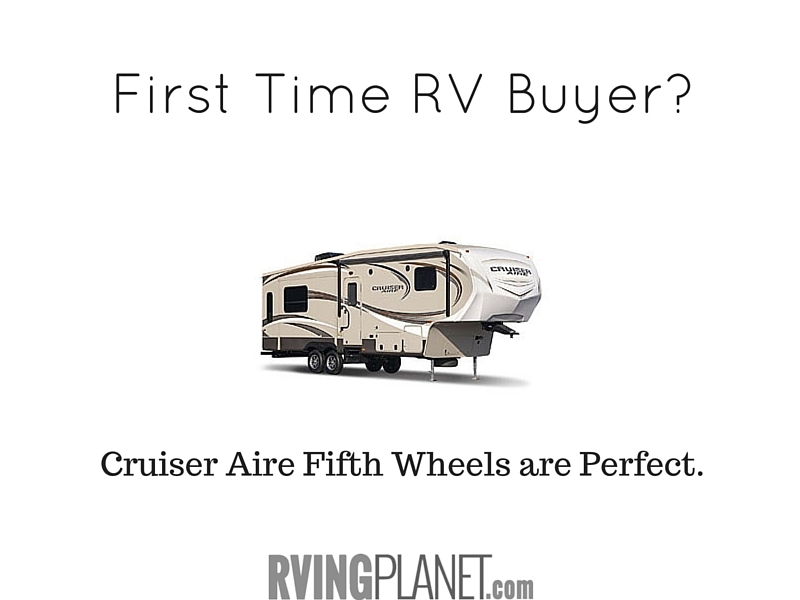 View all Cruiser Aire Fifth Wheels like this. 1. They took all the great features from higher end models and removed the features that are unnecessary to make this first time buyer RV. Get started now looking at New Crossroads Cruiser Aire Fifth Wheels. Nate: Hi again. This is Nate with RVing Planet, and I have Jim Hickey here with Crossroads RV. He is the Product Manager of the Cruiser family, and today he is here to show us some of the cool features of some of the Cruiser RVs. Jim: Thank you. I want to talk about the Cruiser Aire product that we’ve come out with this year. Cruiser Aire has been around for quite a while, but we decided to focus on the family and be more price conscious. We went ahead and kept a lot of the great features of the Cruiser Aire, but took away some of the features that maybe don’t matter to that first time RV buyer. I want to focus on the high gloss gel coat fiberglass, and slam latch baggage doors. We still have the nice aluminum wheels, the rolled roof edge on our units. Just some really nice features that we offer, and what’s nice about the Cruiser Aire is that we offer floor plans from 25 foot all the way up to 32 foot. Family focus with bunks, all the way up to that mom and pop unit that people are looking for. A few of the features that we’ve added to the Cruiser Aire this year is we now have an optional fireplace that we didn’t have last year. Obviously that would require the 15 amp service which is a option for Cruiser Aire, along with we have an option for a second AC up front, which again a lot of these price point units don’t offer. Again, in the premium package I do want to feature we do get a nicer fascia, some more decorative glass, and raised paneled hardwood cabinet doors, and 8 cubic foot refrigerator, and things along those lines. What’s great about the Cruiser Aire is we now offer a premium package which brings some of the higher end features, but still focuses on price. For example, we now introduced a painted automotive paint front cap, a receiver hitch on the back, correct track, and Equa-Flex suspension, while still keeping the integrity of the high gloss fiberglass, and the slam latch baggage doors, along with that rolled roof edge that I was talking about earlier. Nate: Thanks, Jim. That was awesome. Very informative, and so you can check that out in the video notes below, or if you want to head over to the [RV News](http://www.rvingplanet.com/blog) section. Thank you for watching. View all of Crossroads RVs.